Curved Stairs - We appreciate a good first impression. Curved Stairs – We appreciate a good first impression. First impressions are important. Whether considering the impression a person makes upon others when first introduced or the experience of entering a residence or commercial building for the first time, initial impressions tend to last. A custom, curved staircase is a striking addition to any home or commercial space and truly offers the best first impression. From inspiration to installation, our innovative team will deliver a custom curved staircase to satisfy your vision, make an impact, and boost the value of your home or commercial space. Curved stairs are custom staircases built in a helical design. 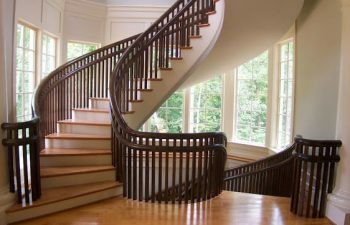 Supported by wood or metal stringers, round staircases create a luxury look through their custom curves. Our team is proud to deliver the finest quality curved stairs from coast to coast. We leverage extensive experience, talent and capabilities to exceed client expectations and ensure our custom staircases stand the test of time. Our skilled team works with home builders, contractors and architects across the nation to enhance commercial and residential projects with the addition of custom curved staircases. From Beverly Hills to Boston, we are committed to meeting schedules and delivering the highest levels of quality and precision in each project. Successful custom staircase construction offers functionality, safety, quality, and aesthetic appeal. Our team of structural design experts and engineers possesses the expertise and precision to bring each client’s unique vision to life, considering any style, budgetary and space constraints. Leveraging advanced 3D modeling platforms and a proven project management approach, we work collaboratively with each client through the design process to design the perfect custom staircase to meet his/her needs. From residential and commercial building codes and permits to the latest trends in design and materials, our skilled team possesses a depth of industry knowledge in custom curved staircase and handrail design. We apply this knowledge to minimize client risk, constructing the highest quality round staircases and following all necessary protocol. Our industry leading design team is highly creative, taking an innovative approach to custom curved staircase design. While creativity and “thinking outside of the box” are critical to delivering unique and striking designs, successful project execution requires a proven, standard approach. Through our turnkey process, each curved staircase is built in our advanced facility, then delivered to the commercial or residential site for professional delivery. Leveraging a robust project management system, this turnkey approach ensures each custom staircase is delivered on time with flawless execution. Visit our residential and commercial project galleries for additional details and pictures on our exquisite projects. From inspiration to installation our team is committed to designing and building the highest quality custom staircases. Our reputation speaks for itself and client satisfaction is our highest priority. Contact us today to discuss your next curved stairs project.